The father’s role in a child’s life has an important influence on the child’s self-image, capacity to form positive relationships and moral development. Since divorced mothers usually obtain primary physical custody, a common consequence for children is reduced time spent with their fathers. In extreme cases, some fathers, particularly men who have not played an active role in their child’s day-to-day upbringing during the marriage, tell themselves that a “clean break” is best for their child and they withdraw from or diminish their role in the child’s life. Such loss of the father’s love, guidance and attention can be devastating for a child. At the time of separation and divorce, mothers are often overwhelmed by the demands of single parenthood and unable to provide for all the psychological or emotional needs of their children. In such cases, a continued relationship with an involved father can provide additional reassurance and nurturing during this difficult period. Boys who have lost close ties with their fathers often attain lower levels of academic achievement, have difficulty developing a healthy masculine self-image and demonstrate rebellious, aggressive and impulsive behavior. Girls in this situation often have greater difficulty establishing and maintaining healthy and satisfying love relationship with males. They also tend to become sexually active at a younger age and have more sexual partners than girls whose father remains actively involved in their lives. In previous articles we have focused on the emotional upheaval and conflict between ex-spouses as primary factors that create problems for children of divorce. In our practice, we notice an increasing number of situations where the actual physical distance separating father and child is the impediment to the continuing development of the father-child relationship. More specifically, we have encountered fathers who want to maintain close contact but who lack a basic understanding of how to establish a workable long distance relationship with their child. We want to devote this article to discussing some of the ideas we have shared with these fathers… ideas that have enabled them to solidify their relationships with their children, despite being separated by a long distance. In a divorce both parents need to recognize that a father’s continued participation can be vital to the child’s ongoing personality development and emotional well being. They need to work together to facilitate the child’s access to and involvement with the father in order to minimize the trauma that divorce can engender. Except in extreme situations, it is important, therefore, that mothers encourage their children to maintain contact with their fathers and avoid undue interference in that relationship. It is equally important that both parents avoid negative comments about one another in front of the children. Children who have experienced a divorce harbor a certain degree of uncertainty regarding the stability of all relationships. They previously believed that their family would live together forever. However, after experiencing their parents’ separation, it is not uncommon for children to question the stability of their relationship with each parent. Children may assume that if parents can stop loving each other, there is nothing to prevent either parent from falling out of love with them as well. When a child no longer lives in close vicinity to a parent, these fears of loss may intensify and steps must be taken to alleviate such concerns. Three major considerations are keys to maintaining a long distance father-child relationship: stability, comfort and security. In maintaining a long distance relationship the father should ensure regular contact with his child, and these efforts should be supported by the mother. This may be accomplished by telephoning on a regular basis, preferably on the same day and time each week, and by maintaining a pattern of regular face-to-face contact. Mothers and fathers should work together to help the child look forward to and enjoy these contacts. In addition mothers should provide privacy to the child for telephone calls with the father and each phone contact should focus on the father and child sharing personal information about their daily lives. Sharing this type of information provides the basis upon which a mutually satisfying relationship can grow and develop. Familiarity with the highlights of a child’s day-to-day life offers another key factor, comfort, in maintaining long-distance relationships. Mothers can facilitate such familiarity by notifying their former spouse of upcoming school performances, special class projects or other noteworthy occasions. Discussing such basic information in phone calls will increase the child’s sense that his father knows and cares about him. Fathers can also learn how their children are progressing in school by scheduling telephone conferences with teachers, or scheduling visits to coincide with school performances, or other special activities. Schools are also often willing to provide duplicate report cards and notices of special events to a second parent upon request. Children not only feel comforted when fathers know about their daily life, but they are tremendously curious about their father’s life, as well. Thus, we encourage fathers can to share details of their daily life with their child. This effort can be enhanced by sending the child photographs of the father’s home, neighborhood and place of work. Phone calls and video calls can involve sharing highlights, such as the best foods eaten that week or the most exciting television show that they have watched. E-mail and text messaging can also be used effectively between phone and video calls. A third key to maintaining close long-distance relationships is to provide children with a feeling of security. Having already experienced a major disruption in their lives, children of divorce are acutely sensitive to the possibility of further disorder. Such anxieties and fears will cause some children to approach visits with their father with kid gloves in order to avoid any further damage to this relationship. 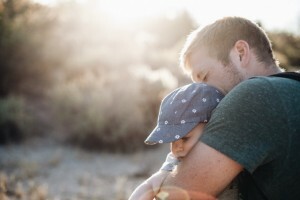 Fathers may also feel anxious, prior to parenting time, out of concern that they will not measure up to their child’s expectations and that the time spent together will disappoint their son or daughter, who will then resist future contact. These feelings of anxiety and concern are understandable. When working with fathers and children, we strongly urge them to communicate with one another by openly discussing their feelings and concerns. We also encourage fathers to spend some time preparing for phone calls and visits beforehand in order to enhance their own feelings of security. Fathers often find it useful to discuss upcoming trips with their children and to allow them to participate in the planning. For example, fathers should inform their child when parenting time will occur, how long it will last, where the child can expect to go, and whether anyone else will be involved in planned activities. Sharing this information familiarizes the child with what to expect and creates a basis for the child to feel secure and for the father to feel a realistic sense of organization and control. Finally, it is important for fathers to establish realistic expectations of parenting time as well as of each phone call and to not unduly pressure themselves or their children for immediate closeness. Fathers need to recognize that parent-child closeness after divorce develops with time and is neither made nor broken in a single visit. As is true with all relationships, father-child relationships have ups and downs and require lots of love and nurturing in order to grow and develop properly, particularly under such difficult circumstances.